David was born in Muncie, Indiana, and has lived in Tucson since 1951. 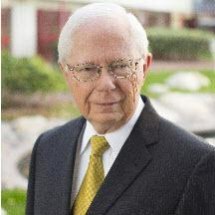 He received his undergraduate degree from the University of Arizona in 1967, and his law degree from the University of Arizona College of Law in 1970. While in the College of Law, he was on the Arizona Law Review, a publication of the College. David is a member of the Real Estate and Tax Sections of the American Bar Association, the Real Estate and Probate Sections of the State Bar of Arizona. He has also served on the Executive Council of the Probate and Trust Section of the State Bar of Arizona. He has received several awards from the Volunteer Lawyers Program of Southern Arizona and the State Bar of Arizona for his volunteer work. He also frequently makes educational presentations to small groups of non-lawyers on various estate planning issues. David and his wife, Sally, have two grown daughters and four grandchildren. They have been active in the United Methodist Church most of their married lives. Earlier in their marriage they volunteered countless hours in children's and youth work. For many years David and Sally were involved in the Praise Team at their local church and also were involved in the structure and presentation of the non-traditional worship service. More recently, they have been active in other areas of the church. David enjoys “playing with” the guitar, riding bicycles and reading.